Happy belated Thanksgiving! Here is a little update on my Thanksgiving festivities and foods. Before heading back home for Thanksgiving, my roommates and I had a Friendsgiving at my apartment last Tuesday. It was my first time any of us had cooked for a large group of people or been “hostesses” of a little gathering. Last weekend, we planned the menu and went grocery shopping and then Tuesday after we were all done with class, it was all hands on deck. We had lots of paper chains and toilet paper tube turkeys for decorations, plus lots of peeling, chopping, mixing, and cooking for our meal. We served chicken (I know, not your traditional Thanksgiving but we were all going to have turkey on Thursday so we decided to mix it up), sweet potato fried, corn on the cob, homemade bread, and an apple crisp, plus the mashed potatoes, stuffing, gravy, green beans, broccoli, and pie, our guests brought. We had an amazing time and would love to do it again! For our family Thanksgiving, I had to get creative after my Fruiturkey from last year. This year, my mom and I made a turkey out of vegetables. Our vegetable turkey was much easier and less time consuming than the fruit turkey, but he was just as cute and delicious. We used pea pods, bell peppers, cucumbers, baby carrots, grape tomatoes, and broccoli around a bowl of hummus. The body is made of a mini cucumber with a carrot beak, red pepper snood, and black peppercorn for eyes. I also tried to get creative with the fruit tray this year, but it didn’t work out completely as planned. The goal was to make a cornucopia out of waffle cones and stuff them with fruit. It didn’t quite turn out to look like the cornucopia– Oh well, just an excuse to try to make something new next year. But in any case, grabbing a cone filled with fruit was a new, fun twist on the traditional fruit bowl. I love exploring and trying new things, especially when it comes to food. In some of my other posts I have talked about how I love going to the grocery store—it is so exciting for to see what new products I can find and new foods I can try. Going to restaurants is always a struggle because I always want to try everything on the menu. Adding variety increases the types of nutrients you get. Eating the same 5 fruits and vegetables isn’t bad, but it also means that you are missing out on the nutrients you can get from other kinds of fruits and veggies. Try eating a variety of different colors- different color fruits and veggies provide different types of vitamins and minerals. This goes for whole grains and low-fat dairy products as well. You might eventually learn to like something. We have all heard that you have to try a food 8-12 times before you know if you really dislike it. That’s because our natural instinct is to dislike unfamiliar foods. Our first impression is often wrong so try something at least a few times before you give it an official ruling. You might find something you didn’t know you liked. What do you have to lose? If you never try you will never know if you like it! It sets a good example for kids. If you spend any time around kids, you know that they want to follow your every move. If they see you eating all different kinds of foods, they are more likely to do the same. If trying new foods is not your thing, start small. Instead of trying completely new foods, try preparing some of your favorites with new seasonings or toppings. Buying one new vegetable per week and adding it to your dinner is also a small, realistic step to expanding your palate. While I am really good at spending hours in the grocery store finding new types of nut butter, fancy snack bars, and unique fruits and vegetables I have gotten pretty lazy about trying new recipes. So, my goal for the rest of the semester is to print off two new recipes to try each week. Hopefully I’ll make some yummy, new things to share with you! What is your goal for trying new foods? Happy Thanksgiving! I hope your day was filled with family, friends, laughter, and lots of delicious food, just like mine was. As my contribution to our Thanksgiving meal I was in charge of fruit for dessert, but in true Dana fashion, I had to try something new. A few weeks ago I stumbled upon a cute turkey made out of fruit on Pinterest, so I decided to give it a shot. Here is a picture of how my fruiturkey came out. Since I didn’t have much else to do on this lazy Thanksgiving day, this little guy kept me pretty busy. Trying to feed the tiny kiwi slices onto skewers was not an easy feat nor was poking the skewers into the hard melon, but after many hours of washing, peeling, slicing, and building, my fruiturkey was finally complete. All the work definitely paid off, and I was surprisingly pleased with how well he came out. He made for a great centerpiece and it was much more fun to eat fruit, plucking out one fruit feather at a time. While a fruiturkey might be a little difficult and time consuming, I definitely recommend mixing things up at holiday meals (or everyday meals). Serving foods like fruits and vegetables in a fun, new way can make people (especially kids) more excited to eat from these neglected food groups. In the end, just like all the other turkeys today, my fruiturkey ended up in many happy and stuffed tummies. Happy Thanksgiving! Head: Pear with blueberry eyes and a strawberry slice for the snood (the red part on a turkey’s neck). I used tooth picks to hold the pear onto the cantaloupe. I have always struggled to eat a good breakfast. I’m simply don’t really like to eat a lot in the morning. Most of high school I went without breakfast or just grabbed some fruit for the car ride. While fruit is not a bad option, I always found myself hungry after an hour or two and was starving by the time lunch came around. I recently got very frustrated with this vicious cycle on not wanting to eat breakfast and then being hungry all morning. I thought there had to be something that was healthy, quick, and filling. I tried yogurt, eggs, and granola bars but nothing really made me feel great or kept me full. The only thing I hadn’t tried: Oatmeal. Unless it was in a cookie, oatmeal always kind of freaked me out. The mushy texture reminded me of baby food and was very unappetizing, but I decided I would give it another try. I went to the grocery store and stared at the shelf of a zillion oatmeal choices reading every box to see what would be the best choice. I wanted something that had little sugar and wasn’t highly processed. 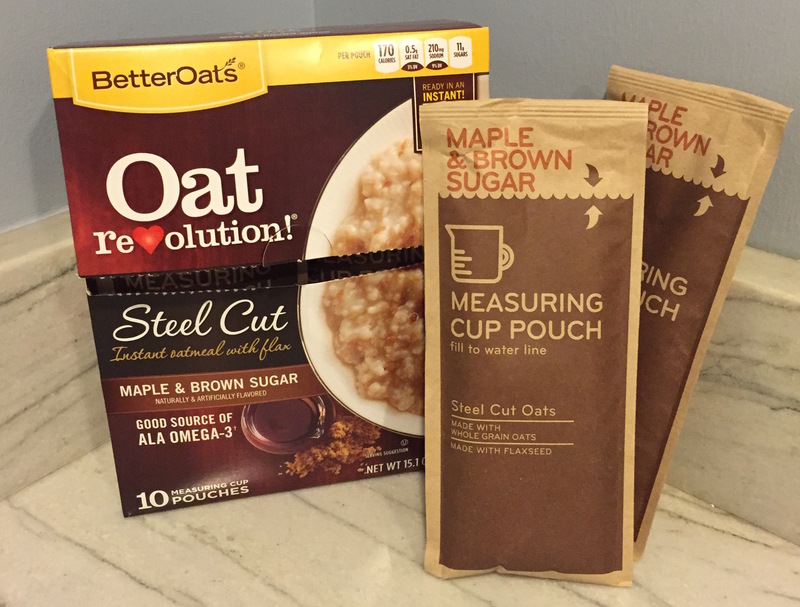 I found Better Oats Oat Revolution Steel Cut Instant Oatmeal with Flax (I got the Maple and Brown Sugar variety) to be a good option. It only had 5 ingredients and had added flax for and extra fiber and Omega-3 boost. The next morning was the big taste test. I had no expectations and almost had to force the first mushy spoonful into my mouth. Much to my surprise, it was not nearly as bad as I had expected. In fact, I wanted another spoonful. It wasn’t too flavorful so for someone like me who doesn’t like to eat in the morning, it was great. That day was the first in many years that I went to work/school without my stomach rumbling at 10:00am, and I was actually shocked that I didn’t feel the need to inhale as much as I could during lunch. Since that day a few weeks ago, oatmeal has been my breakfast pretty much every day. I am definitely looking forward to be able to sit through my morning classes at school without counting down the minutes until lunch. I am now obsessed with oatmeal!